The agenda for Monday’s February 1, 2019 Shoreline City Council meeting includes two Study Items. (a) Discussing Fircrest Master Plan and Underutilized Property Land Use Options. 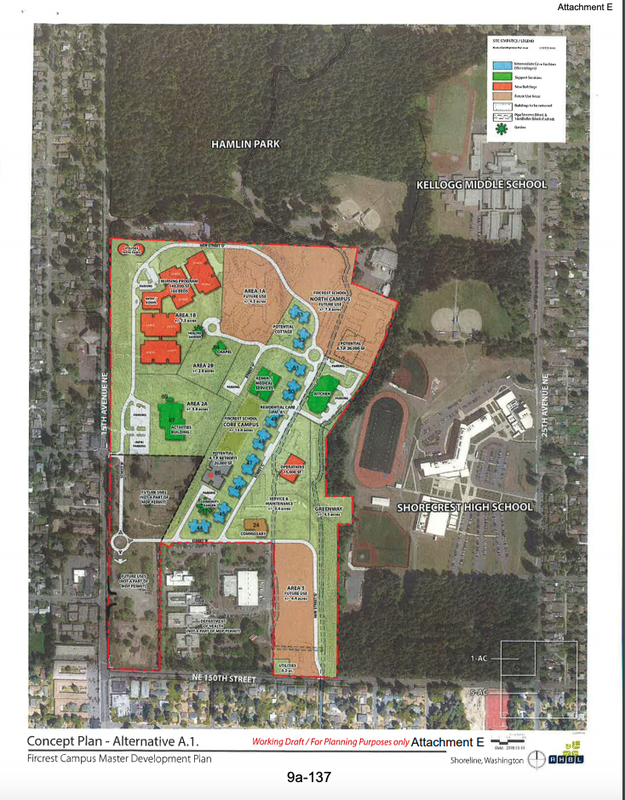 Staff is bringing this item to Council to better understand the Council’s preference for the City’s participation in discussions and actions that could lead to land uses, zoning, and/or development of underutilized property at the Fircrest Campus. The State is interested in maximizing the number of affordable housing units that could be built. City staff has continued to advocate for mixed-market housing, which is reflective of the City’s adopted housing policies. There are various options on how the City can work with the State to address the State’s interests in repurposing portions of the Fircrest Campus. The location of the Governor’s requested BHFs (Behavioral Health Facility) has not yet been decided but, DSHS expects that the Fircrest Campus could be considered. DSHS indicated that if the Fircrest Campus is considered, then DSHS would anticipate that the focus would be on Area 5 (Attachment E) of the Fircrest Campus for either a 16-bed or 48-bed facility. The south-west corner would be the only area on the campus to support a 150-bed facility. A BHF is a state-owned and state-run community-based mental health facility providing services for clients that currently are (or would theoretically be in the future) served by Western and Eastern State Mental Health Hospitals (Hospitals). The Governor’s proposal would reduce clients in the Hospitals that are civil in nature, leaving the “forensic” cases coming from the criminal justice system and the more complex civil cases at the Hospitals. For 2019, staff proposes a continued focus on funding and support for investments in the NE 145th Street Corridor and the associated I-5 Interchange. This supports our goals for the 145th Corridor, the interchange replacement, a pedestrian overpass serving the light rail station and redevelopment of the station area for housing and economic development. Comments above are taken from the staff reports available online. Please note the pool and building are considered in good shape! City, please get going on offering the necessary improvements to the pool so it can be opened for use by Shoreline and Fircrest residents! It could be used by Shorecrest and Kellogg for PE, swim teams, etc. A renovated pool would then be utilized by future inhabitants of the new multi-use campus, or even the employees of the industries the city council envisions on the site to increase revenue to the city. Win/win!